Animals are always a fun choice when you're looking for something new to crochet. You can make them two-dimensional (flat) or in amigurumi (3d) style. You can incorporate them as motifs into larger projects, such as blankets, or make the animal the star of the show. You can crochet animals that look realistic or animals that look like cartoons. You could probably crochet an animal every day for the rest of your life and still not exhaust the possibilities that are out there for animal crochet. Here are some of the best animal crochet patterns to get you started! 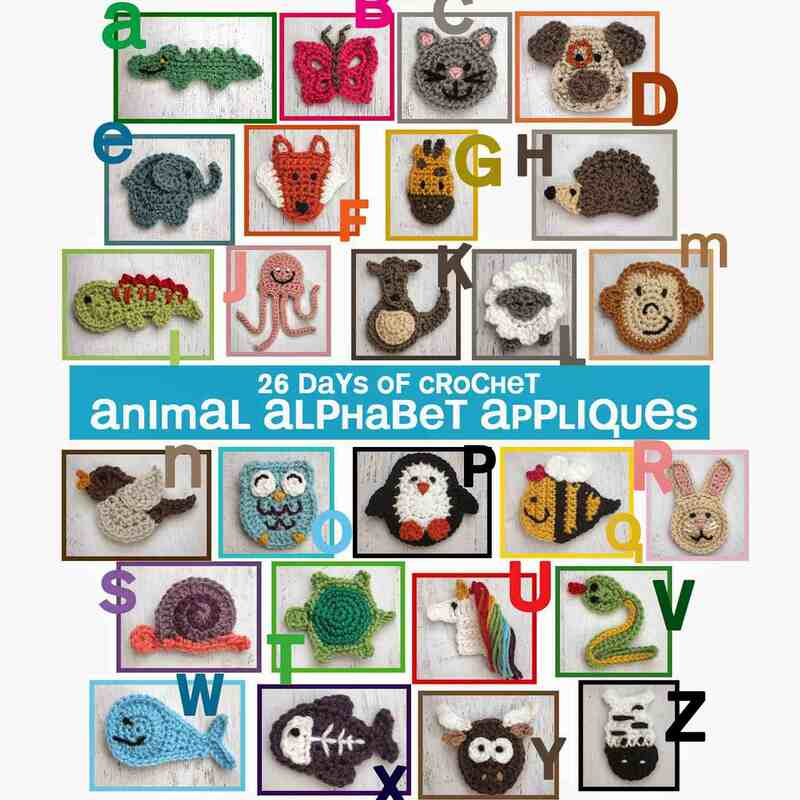 You can crochet a diverse array of different animals when you use the free set of alphabet-inspired animal patterns by Sarah of Repeat Crafter Me. These are flat applique-style animals, some of which are common animals (C is for Cat, D is for Dog) and others that are more unique (Iguana, Jellyfish, Viper). This is one of the best collections of free animal crochet patterns around. In the aforementioned set of appliqué patterns by Sarah of Repeat Crafter Me, "E is for Elephant" and this is one of the free patterns included in our roundup of elephant crochet patterns. The roundup also includes a number of different types of elephants including the textured appliqué pattern shown here by Nifty Mumzy and elephant bookends by Tamara over at Moogly. So many cute ideas here! Crochet teddy bears are certainly one of the most popular choices when it comes to animal crochet. Who doesn't want an adorably, cuddly little teddy bear? They make great gifts for people of all ages, and are uniquely special as a baby's first gift. The cute one pictured here is Sleepy Bear by Squirrel Picnic, who incidentally has a terrific crochet storybook (with patterns) called The Big Acorn Race. This is just one of the ten free teddy bear crochet patterns in our previous roundup. Squirrel Picnic also has crochet squirrel patterns, of course, one of which is included in another roundup: 10 free squirrel crochet patterns! The groundhog might not be nearly as popular an animal as the teddy bear but when Groundhog Day comes around each year there are always people seeking crochet groundhog patterns, so we have them all rounded up for you. Some of these are free crochet patterns, including the Groundhog Finger Puppet pattern by Mad Crochet Lab seen here. Stuffed Monkey Free Crochet Pattern. What is cuter than a monkey? A crochet monkey, of course! The cute stuffed monkey crochet pattern shown here is by Bodecia's Oddities. The roundup includes other stuffed animals, a finger puppet, appliqués, monkey potholders and more. Although not quite a "real" animal, we also have a roundup of 10 free sock monkey crochet patterns. Each year of the year is associated with an animal in the Chinese Calendar. One, for example, is the monkey - so the patterns above would be great for that. Another is the sheep (although sometimes it's called the Year of the Ram or Year of the Goat). Our roundup satisfies all of those ... and it's just fun to crochet the same animals where our fiber comes from! The sheep pictured here is a free animal crochet pattern from Look At What I Made. Penguins are a cute choice when you want to make a crochet animal, because they are unique from the animals that most other people are making. The one pictured here is a holiday crochet penguin pattern by Stacey Trock, who is terrific at making animal stuffie crochet patterns! A lot of animals can be turned into animal-hats which are really cute especially on babies. If you want to do something fun and funny for Thanksgiving, try making a set of crochet turkey hats for everyone joining you at dinner! The one shown here is a free earflap turkey hat pattern by Lakeview Cottage Kids. Cute Critter Crochet. The name says it all! So cute! Crochet a Farm. This one is for folks who want to craft farm animals. Bathtime Buddies. This crochet book is by the same author of Crochet a Farm and features underwater animals designed to go in the bath with baby. Crocheted Sea Creatures. These are also underwater amigurumi designs, although not made to actually go in the water. The Big Book of Little Amigurumi. There are more than seventy crochet patterns in this book, many of which are animals. Happy-gurumi. This is also an amigurumi pattern book rich in animal designs. Sweet Crochet. This book has one dozen patterns for animals with tall bodies and long ears.